Also known as “Advance directives” are legal forms that allow you to provide instructions regarding your medical care. Completing these forms is important because they extend your right to choose what type of medical care you want to receive in the future if you cannot communicate adequately with healthcare personnel. One type of advance directive is the power of attorney for health care. 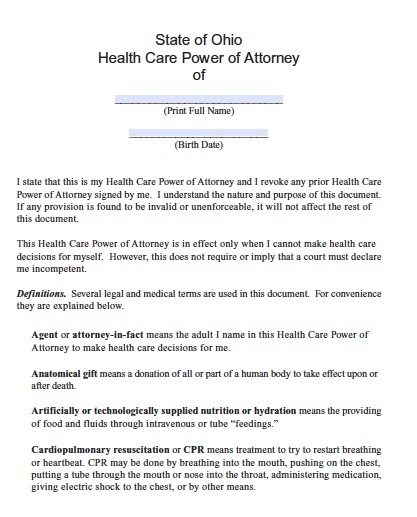 This document grants your agent the right to make healthcare decisions for you to the extent that you could if you had the capacity to make decisions. This includes the right to refuse or consent to any treatment or test to improve, diagnose, or affect any mental or physical condition. The agent would be able to discontinue life-sustaining treatments as well if you are terminally ill and will die in a short period without the treatments. You can also freely limit the agent’s authority as you wish. A living will is another type of advance directive. It allows you to dictate that you wish to discontinue life-sustaining treatments if you become permanently unconscious or have a terminal condition that will cause death shortly. With each of these directives, you will still receive every type of treatment you wish to make you more comfortable, such as pain relieving medications and procedures. Directives can be valuable because they can prevent emotional conflict among your loved ones who would otherwise have to decide whether to end your life support.